I love participating in the Virtual Paintout each month. Bill Guffey hosts and chooses the monthly location based on cities the Google Street View vehicles have covered. Bill posts the submissions on his blog and on Facebook. 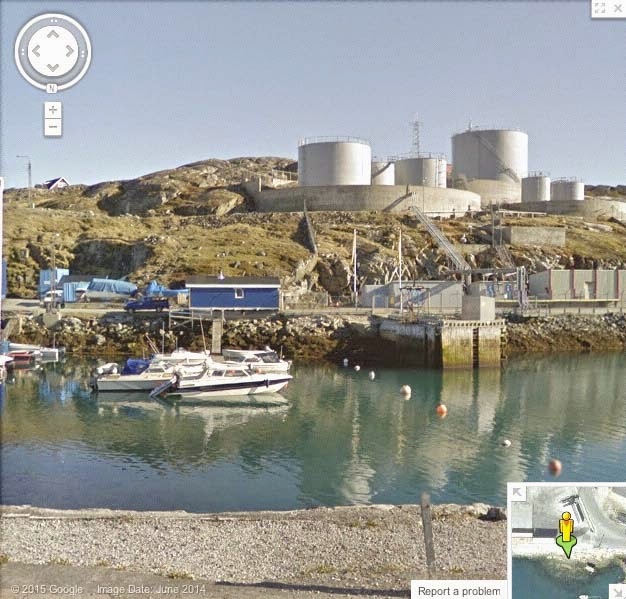 For March 2015 we traveled to Greenland for our paint-out views. Another place I will never see in person! 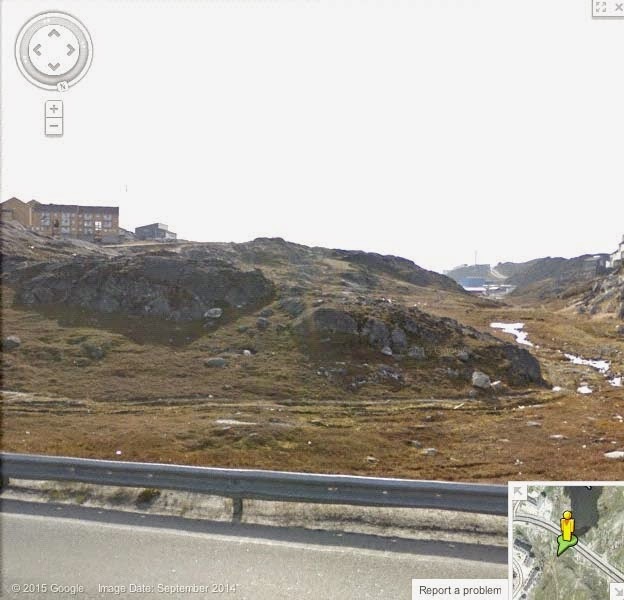 The world's largest island, Greenland is an autonomous country within the Kingdom of Denmark. Under 60 thousand people live there. As much as I had time to look around, I didn't see any trees or animals. According to Wikipedia the most significant inhabitant is the group of microbes that colonize cryoconite (windblown dust) that contributes to rapid glacial melting. Hmmm. Of course there were some beautiful views of the ocean, islands, and several harbors. I had no trouble finding two subjects to paint. 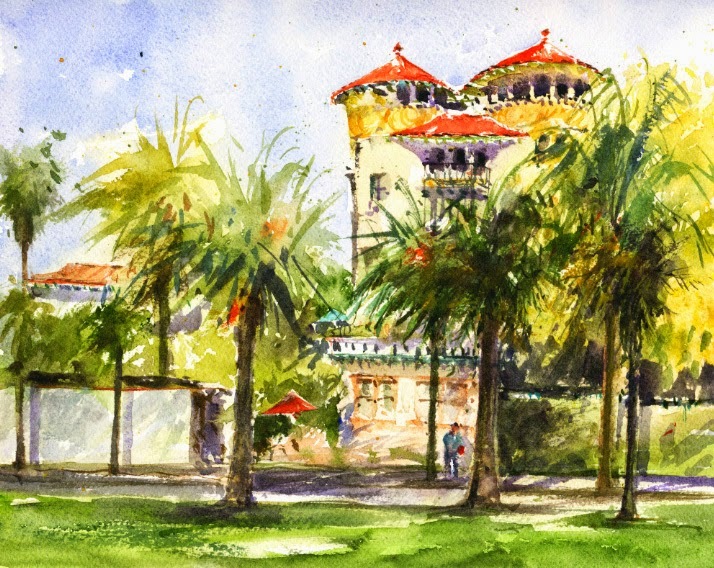 I think I've tried painting the historic Castle Green Hotel (1887) at least five times! It's such a distinctive structure. And such a challenge for artists. I posted my previous watercolor in The Green Hotel. That piece went pretty well. This time I tried a horizontal orientation for the striking and tall hotel. Well, since painting this piece I've taken a workshop from Frank Eber. After learning from Frank, I think I would have attempted this piece a little differently now. Next time! It's been almost two years since I painted at Eaton Canyon. 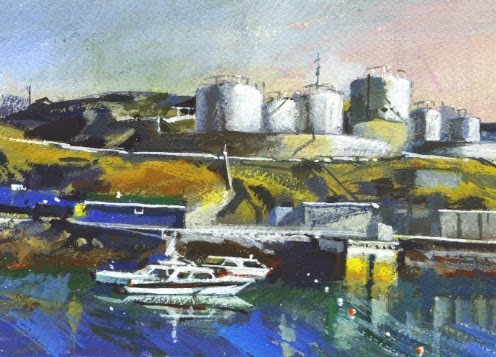 A lot of plein air painters go there for the scenery. Also a lot of school kids have field trips there for nature walks. On my visit to the nature center two years ago to paint, I was learning how to get more familiar with using gouache. I was ambitious and painted two pieces which I posted in February in Eaton Canyon. This time I tried another gouache piece and included the electric transmission towers. 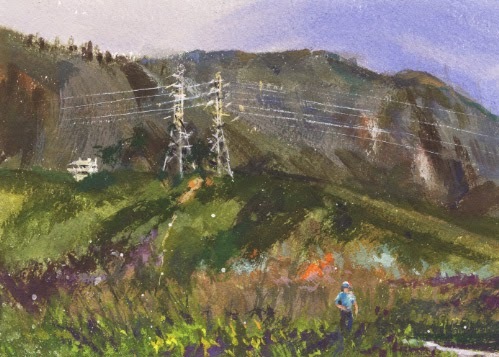 I painted the towers on my second visit to Eaton Canyon and posted that watercolor in Eaton Canyon. The transmission towers are interesting to me and occupy a huge swath of property for miles. I like to include them in my plein air paintings when they are in my view. The Saturday paint-out group recently met at the Audubon Center at Debs Park. I've painted there once before and posted that watercolor in Debs Park. On that day over two years ago there were beautiful dramatic shadows and I found the same great shadows this time. There is a huge pepper tree in a children's play area. The tree's fabulous trunks and shadows called to most of us in the group. I'm hoping to explore more of the huge and hilly park sometime soon. 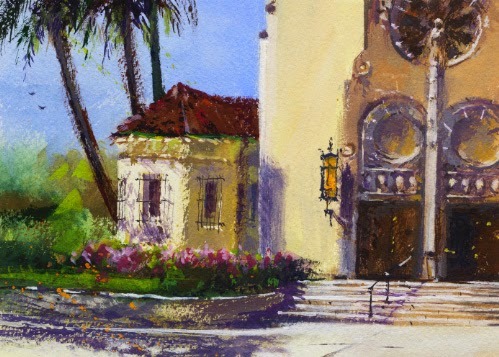 I've been doing plein air paintings for three years now and just tried my first church piece. The local Catholic church, Holy Family, is just a block from my home. It's a spectacular old Spanish Baroque building, completed in 1928. Our Saturday paint-out group met there on a warm day, all of us looking for some shade. I chose a view from under a tree across the street and tried a gouache piece. With such an ornate building, I thought I would need the flexibility of the opaque paint! 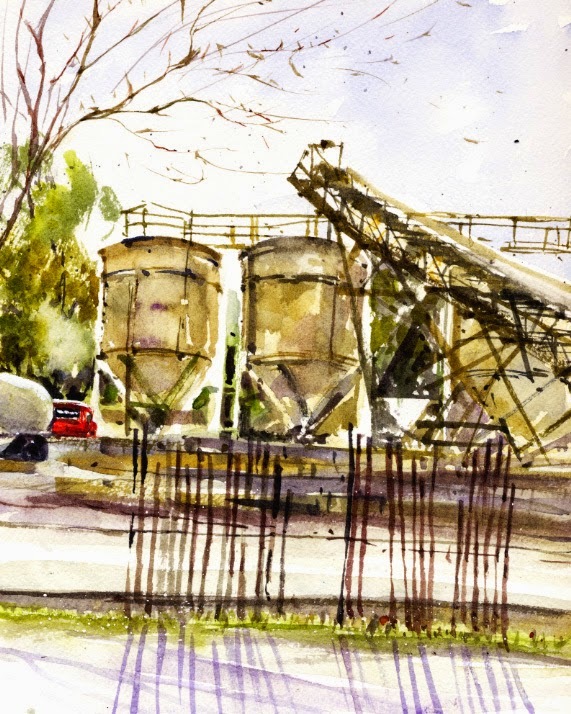 Last week a paint-out group met at Pasadena Lumber, owned by one of the painters. I was really looking forward to this different painting location. The lumber and milling business has been there since 1903 and there were some neat old buildings on the property. I spotted Robertson's Ready Mix next door and couldn't resist trying my version through the fence. I love industrial subjects for some reason so I was happy for this opportunity. The red cement trucks kept arriving to fill up and one was fun to add. The group is looking forward to next time, and I'm glad to know about the services offered at Pasadena Lumber. 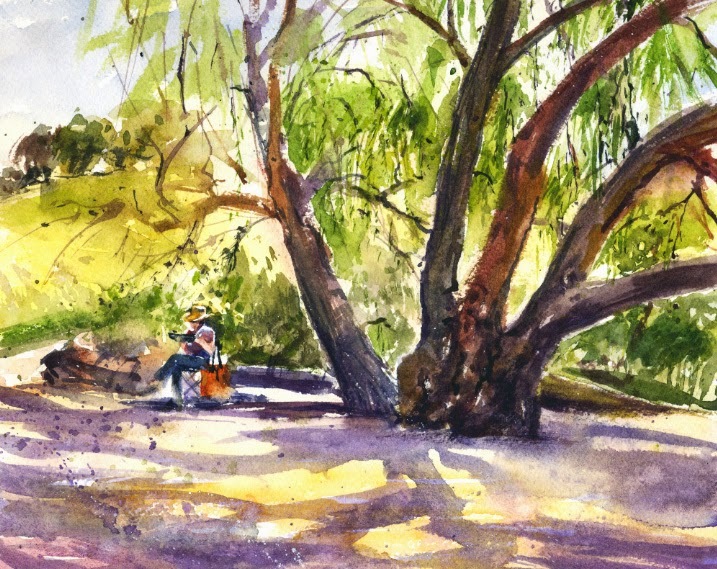 On a chilly and dreary Friday, one of the plein air groups met at Descanso Gardens. The gardens are always a treat with so many plants to see. We're never sure exactly what will be blooming or what they've planted for a show of color. It turned out that some cherry trees were in bloom beside the pond near the entrance. Rain was predicted so it seemed like the pretty blooms would be gone in a few days. The atmosphere seemed Monet-like to me with the hazy blues and cool colors of the pond and flowers. At the pond there was also a tulip magnolia with some dark pink flowers remaining. 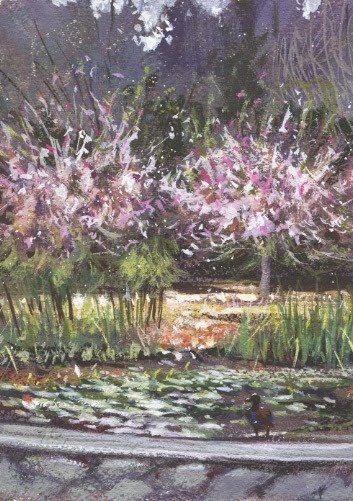 I decided to try a view of the cherry trees across the pond in gouache, and I would add the tulip tree in the foreground. A year ago I painted a different variety of cherry tree at Descanso and posted that watercolor in Cherry Trees! As my gouache was looking almost complete, I thought the foreground tree wouldn't work out after all. Maybe if I was doing a larger painting I could have included it. I added a female mallard instead. She had two suitors following her every move. On an overcast day a few weeks ago the Saturday plein air group met at the Waldo Ward Ranch in Sierra Madre. 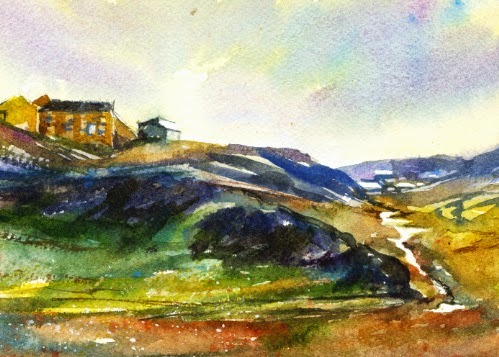 I've painted there quite a few times and posted my previous watercolor in Back at Ward Ranch. Another visit to the jelly factory property is always fun and there are a variety of views to paint. 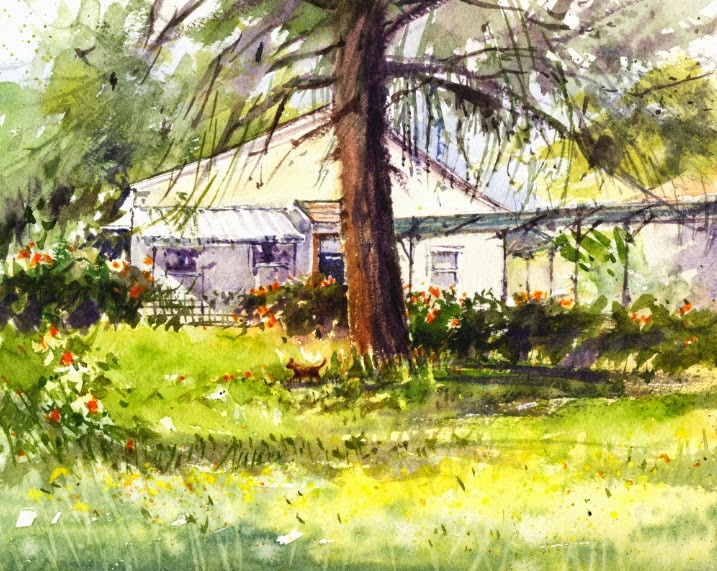 I've liked the look of the house just to the west of one of the orchards and decided to give it a try in watercolor. After a rain, the bright green grass and bright yellow flowers caught my eye.